“A Muslim has been beaten to death in the eastern Indian state of Jharkhand after reportedly asking a group to stop playing loud music on New Year’s Day. The incident happened in Mandar, a town close to the state capital, Ranchi. People blocked the national motorway on Tuesday to demand the arrest of suspects but the blockade was eventually cleared by police. Extra security personnel have been deployed in the area to keep the peace between Muslim and Hindu communities. Waseem Ansari, 19, worked as a daily wage labourer in Pune and had returned to his village a couple of days ago. 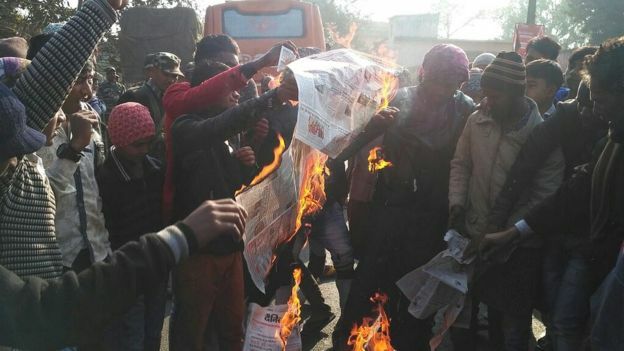 A senior police officer gave BBC Hindi an account of the incident: “Preliminary inquiry suggests that a group was playing loud music to celebrate New Year’s Day. “Waseem Ansari and two of his friends approached the group and told them to stop playing loud music. This led to an argument and Waseem was attacked by the group. It seems he was hit by one of the sharp instruments used in cooking. Hasibul Ansari, who lives in the same village as the victim, told BBC Hindi: “These people were partying near a Muslim graveyard. When Waseem told them to stop, they killed him.